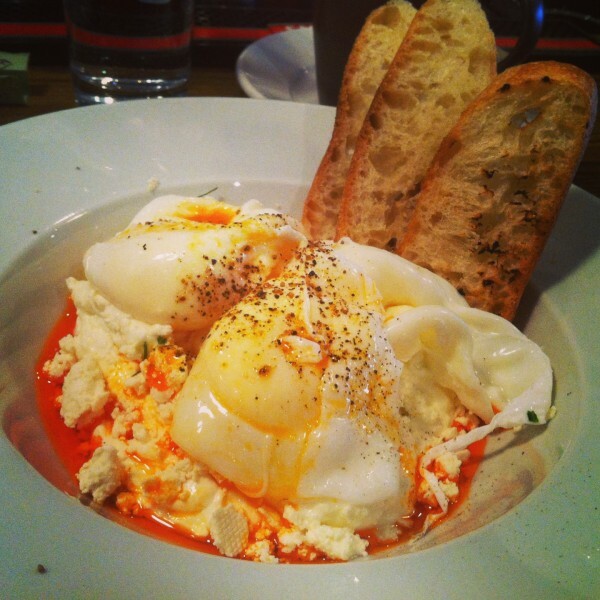 Self proclaimed providers of ‘gourmet comfort food’, Prohibition montreal endeavours to serve brunch as it should be. Nestled on the increasingly popular Monkland street, the spot caters to young families, middle aged professionals and the occasional students. It’s a simple setup – tables take up 70% of the restaurant, lining the walls and taking up the majority of the center aisle. The L-shaped bar seats a good 10-15 individuals that straggle in throughout the morning and early afternoon (that was us). As of right now, Prohibition serves breakfast and brunch only. They’re working hard to obtain a liquor license to accompany the dinner menu (in progress) – making the bar convenient indeed. We ordered coffee and tea to sip on while we waited for our order. As mentioned, because the offerings all sounded good, we had trouble deciding what to actually get! 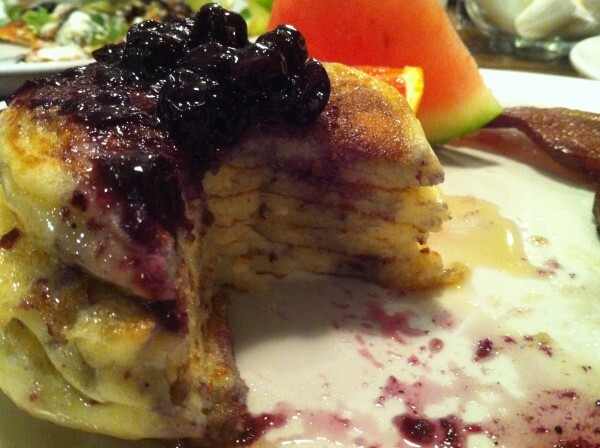 In the end, we decided on lemon ricotta pancakes and huevos rancheros. Not too long afterwards, our plates were ready. Sweet, delicate and airy, the pancakes sat patiently one on top of the other, giving off this unmistakable buttery scent that made me want to drop the camera and forget about taking a nice photo. A thick, generous dollop of blueberry compote oozed down the top of the thick stack and dribbled down its sides, pooling at the base. The fluffy texture and the firm flexibility of the pancakes served as a fitting medium through which to stuff the appropriate amount of lemon and ricotta to make these the most delicious pancakes I’ve had in forever. Cutting out a triangular piece to reveal the contents within, each bite was sweet, but not too sweet. Accompanied by thickly cut sugar bacon, this was pretty much heaven. Similar dreamy feelings towards the huevos rancheros. Laid out taco style with two separate corn tortillas supporting the weight of black beans, guacamole, eggs and sour cream, the dish was garnished with coriander and a good amount of pico de gallo (Mexican salsa). 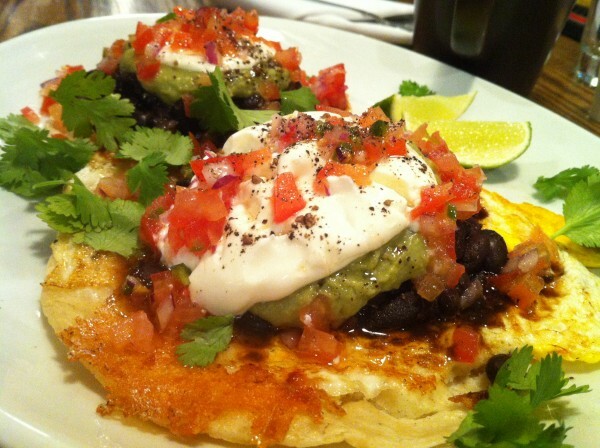 It proved to be a hearty, tasty dish that held its own in light of all the other typical huevos rancheros out there. 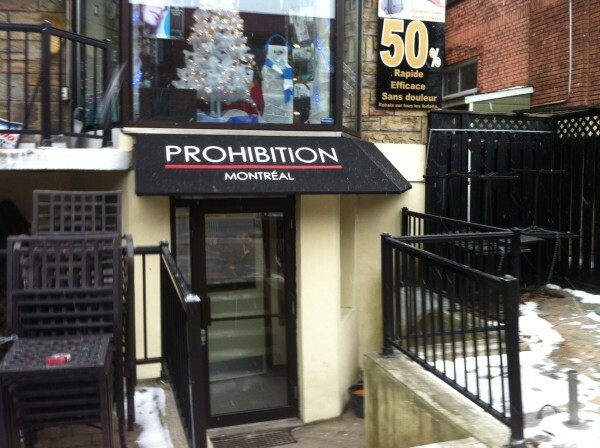 Note: Prohibition takes reservations for brunch. Score! Update: Have been back a couple times since writing this post. We had the maple fried challah french toast with fried chicken and the bulgarian benedict with poached eggs, garlic yogurt, sheep’s feta and paprika oil with a couple slices of toasted baguette. 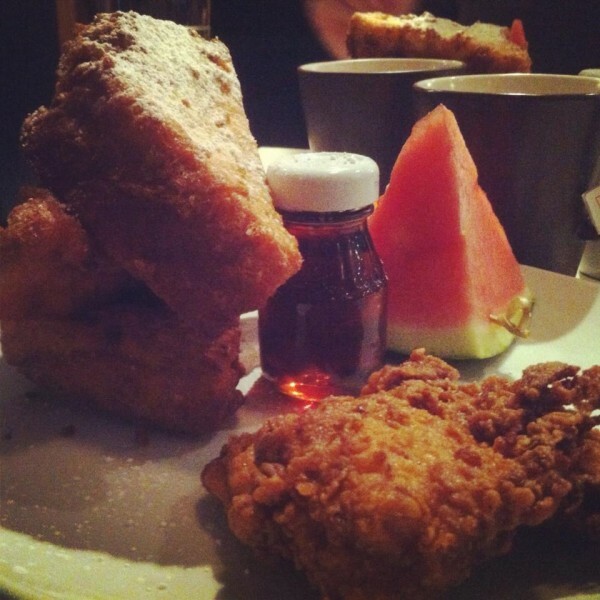 Maple Fried Challah French Toast, Fried Chicken, Cinnamon Sugar, Maple Syrup. 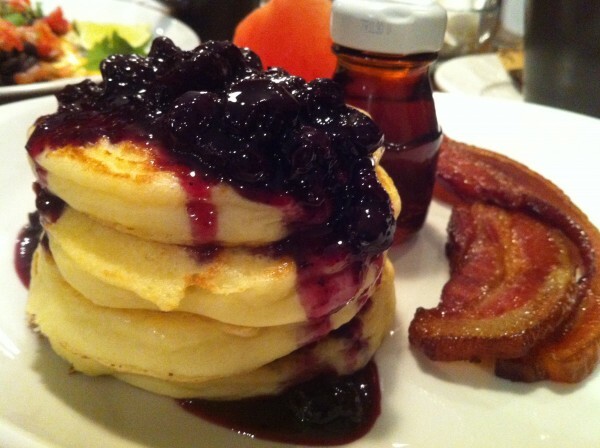 Tags: Bacon, benedict, Blueberry Compote, Brunch, Bulgarian, Challah, forkandtell, French Toast, Fried Chicken, Huevos Rancheros, Maple Syrup, Monkland, Montreal, Notre-dame-de-Grace, Pancakes, Poached Eggs, Prohibition, Ricotta.